Isabella Fox by GigiR Designs - 40 ct. Vintage Sand Dune and various hand-dyed silk threads (Attic Conversion). 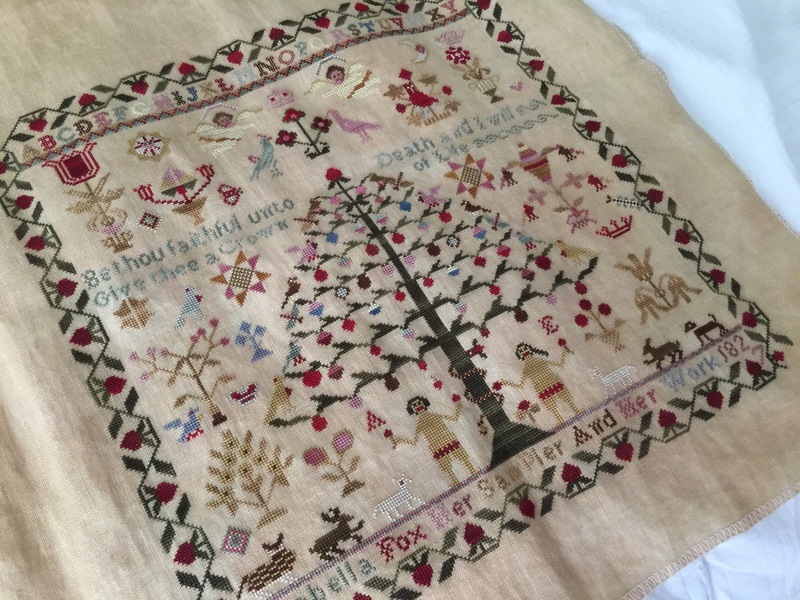 Martha Pudsey 1835 by The Scarlett House - 40 ct. Vintage Meadow Rue by Lakeside Linens and Needlepoint Inc. silk threads (1 over 2). Days 1 and 2 - Start Sarah Redfearn by The Scarlett House - 40 ct. Vintage Examplar and hand-dyed silk threads. Days 5 and 6 - Start Ann Rayner by Threads through Time - 40 ct. Vintage Lt. Examplar using hand-dyed silk threads and NPI silk threads. Days 7 and 8 - WIP - His Eye is on the Sparrow - 40 ct. Country Mocha using various cotton hand-dyed threads. Days 9 and 10 - Start The Scarlett House Smith Sampler - 40 ct. Vintage Meadow Rue using hand-dyed silk threads. Days 11 and 12 - WIP - Love Never Fails by Barbara Ana Designs - 40 ct. Vintage Fawn using DMC. Days 13 and 14 - Start the Scarlett House Mary Linley 1829 - 40 ct. Vintage Meadow Rue using Belle Soie silks. Day 15 - WIP - American Sampler by Plum Street Samplers - 40 ct. Meadow Rue using cotton hand-dyed threads. Thanks Angie! I stitch in hand and that definitely helps me stitch faster. I taught myself when I was 13, so I have never used a hoop or q-snaps. I started out with a hoop. I have tried in hand but feel my stitches are just not as neat. Maybe I need to practice more. YAY! Another video! I haven't watched yet...saving it for later!!! ♥ Now my husband knows who you are because he watched a bit of your last one! Thank you for another video. It's so inspiring to see your Stitch Maynia posts! I don't know much about silks and would love to learn more about why you choose them or don't.